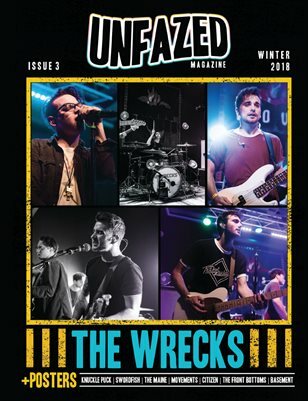 Interview with the guys in The Wrecks! We also have interviews with Buster Shuffle, Wee Beasties, lovelytheband, Pacific Radio, Safeguard, Curtis Walls, and Crimson Apple. There is also tons of concert reviews of bands such as Waterparks, As it Is, Sleep on It, Chapel, Roam, New Found Glory, The Maine, and more. There is also winter fashion, a winter playlist, and a list of holiday movies! Not to mention TONS of posters, and we tell you how to become part of the Unfazed team!